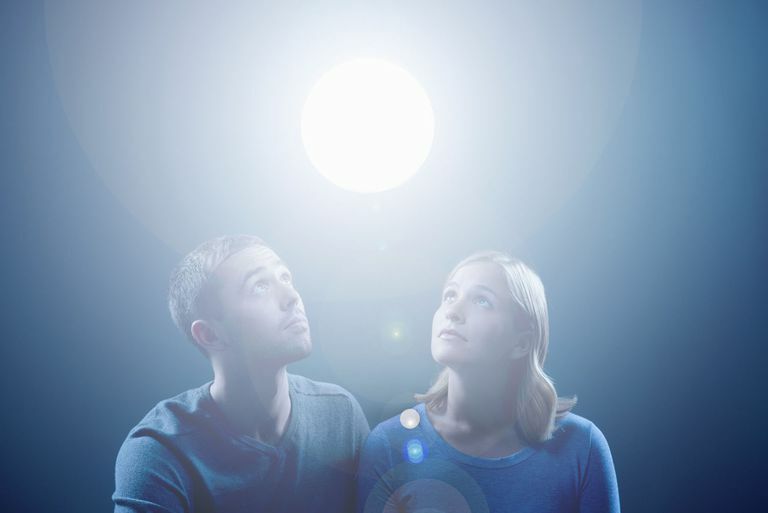 Orbs -- spheres of light that are either white or feature different colors -- sometimes show up in digital photographs or are seen in person by people who wonder if these gloriously beautiful lights represent the presence of angels with them. That may be so. Since angels travel to the earthly dimension through light rays, they sometimes use orbs as vehicles for their energy to travel within. Orbs are electromagnetic energy fields that contain angelic energy, which appears to humans to humans in the form of light. Angels sometimes use orbs as their vehicles -- as we would use a car to travel from place to place -- because orbs are an especially good shape for angelic energy. Since orbs have no corners to restrict energy flow, they can be efficient spirit vehicles. Also, circular shapes like orbs represent eternity, wholeness, and unity spiritually -- all concepts that directly relate to angelic missions. Angel orbs (spirit orbs) usually travel through the universe at a higher vibrational frequency than humans can perceive in our natural fields of vision. But when they've reached the people whom God has called them to help, they often slow down enough to be detected visually. Angels or Just Particles Reflecting Light? Not every orb that happens to appear in a photograph actually represents a spiritual phenomenon at work. In some cases, orb shapes in photos are caused simply by particles (such as specks of dust or beads of moisture) reflecting light, and nothing more. Angel orbs are more than just simple balls of light; they're much more complex. Viewed up close, angel orbs feature intricate patterns of geometric shapes, as well as colors that reveal the different characteristics in the auras of the angels who are traveling within them. While most spirit orbs contain the energy of holy angels, some may contain the demonic energy of fallen angels from the evil side of the spiritual realm. That's why it's important to always test the identity of spirits you encounter to protect yourself from danger. The world's most popular religious text, the Bible, warns that fallen angels under the command of Satan sometimes try to deceive people by appearing to them in the form of beautiful light. "... Satan himself masquerades as an angel of light," the Bible says in 2 Corinthians 11:14. Orbs from holy angels radiate feelings of love, joy, and peace. If you feel afraid or upset in the presence of an orb, that's a key warning sign that the spirit inside isn't one of God's holy angels. Spirit orbs may contain ghosts, as well as angels, some people believe. Opinions differ on whether ghosts are human souls who appear like angels after they die, or whether ghosts are manifestations of demons (fallen angels). The spirits inside orbs usually have good intentions, but it's wise to be discerning around orbs (as it is with any type of paranormal or supernatural phenomenon) and to pray for guidance. White orbs appear more often than colored orbs, and that makes sense because guardian angels travel in white orbs, and guardian angels are present with people more than any other type of angel. If a guardian angel appears to you inside an orb, it may be to simply encourage you that you are loved and cared for, or it may be to inspire you to have faith when you're going through challenging circumstances. Usually, when angels manifest in orbs, they don't have complex messages to deliver. Showing up in an orb is a simple, unimposing way of blessing those to whom they appear. Occasionally, people can see the faces of spirits inside angel orbs. Such faces reveal clues to the emotional messages that the angels are expressing. What Are Angels Made Of? How Common Are Deathbed Visions of Angels? What Do Guardian Angels Do?